A nice Brookie Liz caught on a Brian Zinger mini Muddler Minnow. 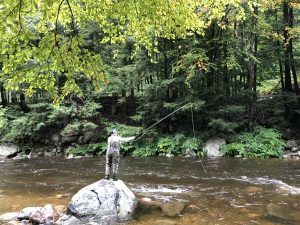 This is one of our favorite times of the year to be guiding and fishing in Vermont. Stunning views, cold water temps and the fish are feeding heavily to fatten up for Winter. The only draw back is it’s getting dark earlier and earlier every day. Today the sunrise was at 6:58am and sunset at 6:18pm. Green Caddis, Hare’s Ear and Copper Johns have been producing for me. I had some chases on streamers as well. Today I got river temps of 54 on the NHR and 53 on the Nesh yesterday. The Otter Creek in the Middlebury area was 56 degrees this afternoon and 679cfs. That’s an ideal flow and the clarity is normal. I had a few Pike follow and one that crushed a fly right at my feet. I was waist deep and it literally came out of nowhere and took as I was about to recast. 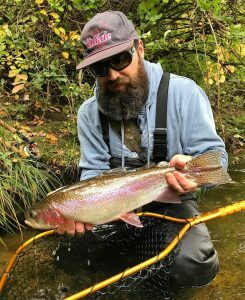 I love the excitement of fish that hunt down flies in the 7”-10” range. I did land a decent Pike yesterday on a Fulling Mill Bunny in Yellow. 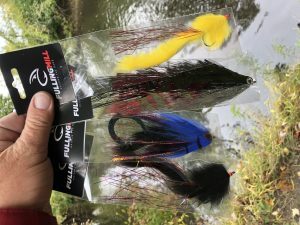 We are giving away a 4 pack of Fulling Mill Pike flies on our Instagram page. Head over and try and win them! 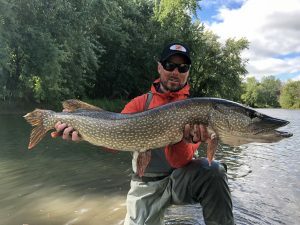 As always when targeting Pike be ready any time your fly is in the water. Plus have pliers, a XXL net and use bite wire. Pink/ White, Yellow, Blue/ Black and Perch colors have been productive. Still thinking of this one Ryan Shea of BrookDog Fishing caught with me in late September. Fish of this size and bigger are always possible when fishing the Otter! This time of year in Lake Champlain and it’s tributaries is when we start prospecting for LL Salmon and other Fall spawning fish. A few of our guides have had recent success. 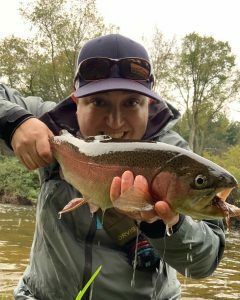 Ralph Kucharek said he had one slam a PT Nymph the other day in fast water. He had to chase it a while before he netted it. Great Fall exercise! Other folks prefer to swing fly’s or strip streamers. However you like to catch them they are a blast and a beautiful hard fighting fish. 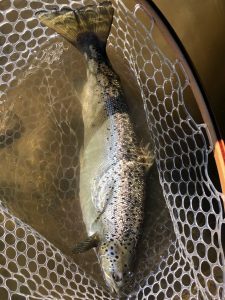 The Northeast Kingdom is also a hot spot for LL Salmon. Guide Tim Hayes texted me a pic of a 27” er he caught today. 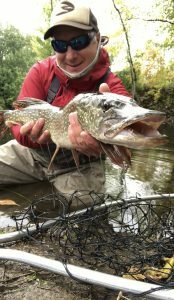 Look for a separate river report from him soon to see that fish and details on the rivers way up North. 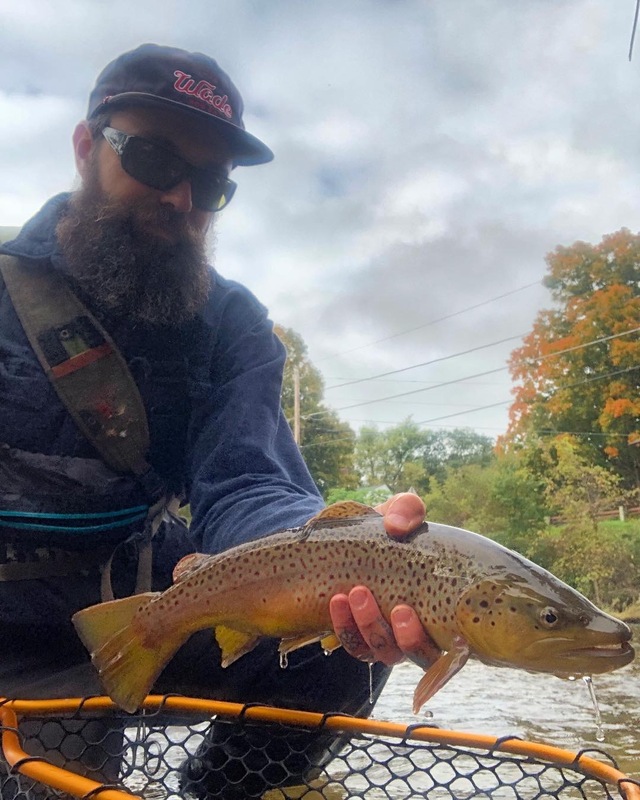 Southern Vt Rivers are on fire right now. 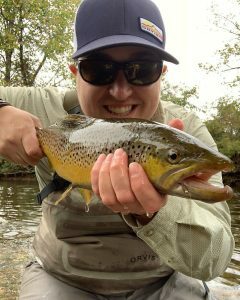 Guides Jen Goodale and Greg Brown plus other friends have been posting some very nice Trout photos in the last week. 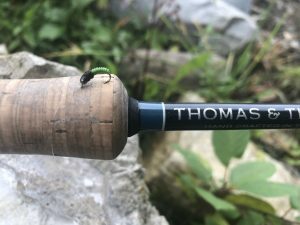 PT Flashback Nymphs, Stoneflies, Hare Ears, Olive Muddy Buddy’s and a Girddle Bug/Zonker pattern Jen just got at Orvis have been hot flies. We do have guides available all of October and November! Hit us up soon as we are starting to fill up the calendar. 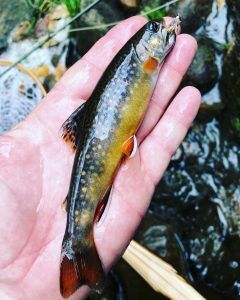 The Vt trout season closes on 10/31 but we have lots of water we fish/ guide all over the state in November and even December. 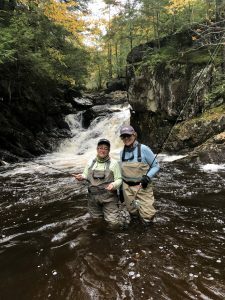 Deb is heavily involved in Casting for Recovery in Alaska and it was fun spending time with her and Liz on the river last week while she was in Vt. Happy Birthday Deb!